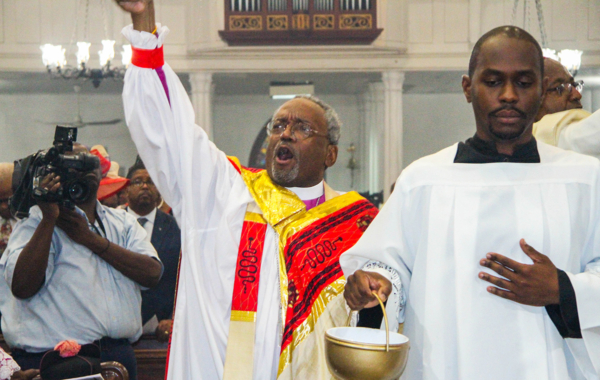 [Episcopal News Service — Nassau, Bahamas] Presiding Bishop Michael Curry electrified hundreds of worshippers who chanted “Love Lifted Me” along with him at Christ Church Cathedral here in Nassau during the July 24 opening Eucharist of the 50th annual meeting of the Union of Black Episcopalians. More than 800 Bahamian and U.S. laity, clergy, dignitaries and officials responded passionately as Curry invoked the hymn, a favorite of his grandmother: “I was sinking deep in sin, far from the peaceful shore, very deeply stained within, sinking to rise no more, but the Master of the sea heard my despairing cry, from the waters lifted me, now safe am I.
Curry’s sermon, laced with frequent call-and-response, spontaneous laughter and sustained applause, echoed his familiar “Love is the way, the only way, there is no other way” mantra, as he challenged worshippers to embrace Christ’s ministry of reconciliation. UBE President Annette Buchanan also invoked the rich spiritual heritage of black Episcopalians. She reminded the congregation that although the organization is observing its 50th annual conference, its precursors date to the pre-Civil War era. The earliest known national organization among black Episcopalians was the Protestant Episcopal Society for Promoting the Extension of the Church Among Colored People, founded by the Rt. Rev. James Theodore Holly of St. Luke’s Church, New Haven, Connecticut, who is considered the first African-American bishop in the Episcopal Church. That organization began in 1865 with four clergy and seven congregations, according to the Rev. J. Carlton Hayden, in an article on the UBE website. Holly later served as bishop of Haiti. The Rt. Rev. Laish Zane Boyd Sr., bishop of the Anglican Diocese of the Bahamas and the Turks and Caicos Islands and celebrant at the three-hour service, welcomed Curry and UBE conference participants. “UBE is 50 years old and has chosen to hold its annual conference for the first time outside the U.S., and we approve,” Boyd said amid laughter and applause. Bahamian officials in attendance included Governor General Dame Marguerite Pindling, Deputy Prime Minister K. Peter Turnquest and Minister of Tourism Dionisio D’Aguilar. Bishops in attendance included Archbishop Julio Murray of Central America, New Jersey Bishop William “Chip” Stokes, Indianapolis Bishop Jennifer Baskerville-Burrows, Massachusetts Bishop Suffragan Gayle Harris, Bishop Suffragan for Armed Services and Federal Ministries Carl Wright, and former Archbishop of the West Indies Drexel Gomez. During the service, the Very Rev. Patrick L. Adderley, dean of Christ Church Cathedral in Nassau, said the congregation’s first building was erected between 1670 and 1684. Spaniards destroyed it in 1684, and also a subsequent building, in 1703. The current Gothic-style building is made of locally cut limestone rocks, held together by their size and weight rather than cement, he said. The current building opened in 1841 and was named a cathedral by Queen Victoria in 1861. At the same time, she designated Nassau a city, “so there is a close and abiding relationship between the cathedral and the city,” he said. The Bahamas, a British crown colony since 1718, became an independent commonwealth in 1973 and celebrates July 10 as its Independence Day. It helped illuminate further Curry’s message of love and reconciliation, and 2 Corinthians 5, the text he chose for his sermon. In it, St. Paul describes believers as new creations, and because Christ died for all, there is a new creation and believers have been given a ministry of reconciliation. This way of love, the love of Christ “is so powerful, so profound, so awesome that it can turn the world upside down, which is actually right side up,” Curry told the gathering. It can also change the way people relate to one another, personally, interpersonally, communally, politically and economically. “Love is surely the way. Turn to your neighbor and say, ‘Love is the way,’” Curry said. He drew laughter and applause with “I attended a wedding a few months ago,” referring to his preaching at the royal wedding of British Prince Harry and U.S. actress Meghan Markle, a sermon that propelled him into the international spotlight. Rather, Jesus was killed by “an unholy alliance of religion, economic power and political power … self-interest and selfishness,” Curry said. As Mary Magdalene and other women went to the tomb early Sunday morning, to do what love required, to anoint Jesus and give him a proper burial, they discovered the risen Christ, he said. Curry continued by saying, “Thinking that the self is the center of the universe and the world and it’s all about me and you are on the periphery, when that selfishness, self-centeredness takes control, you have a world bent on destruction … [and it is] the most destructive force in the universe. It can destroy families, communities, churches, nations and, if left unfettered, will destroy creation itself. Sobering, he recalled the July 8 prayer service that Episcopalians led outside the T. Don Hutto Residential Center near Austin, Texas, during the 79th General Convention of the Episcopal Church. The detention facility, a former medium security prison, has housed female immigrants and asylum seekers since 2009. “And they shouted to the women, ‘God loves you. God loves you.’ Most of the women inside spoke only Spanish. But the Holy Spirit did some translating because they understood what they were saying. “And, inside, the women had towels and they were waving their towels in the windows. “And we were shouting, ‘we love you, we love you, we love you.’ Now, that day we did not break down the walls, but let me tell you something. It took seven times going around the city of Jericho until those walls came tumbling down,” Curry said. “And love will keep going around those walls until the walls keep come tumbling down, until the detention center comes tumbling down, until walls of injustice come tumbling down. Love does not quit. Love does not give up. Love will get up … love lifted me. Love lifted me, when nothing else could help. 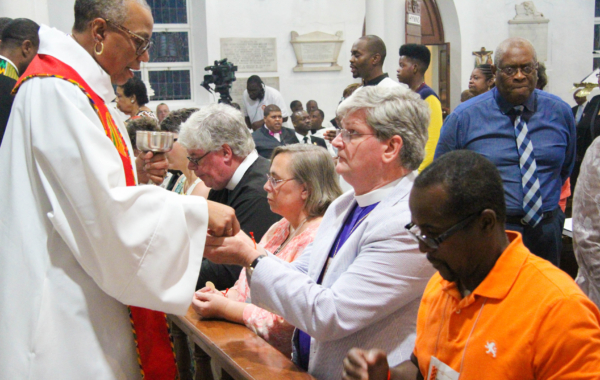 The Diocese of the Bahamas and the Turks and Caicos Islands encompasses some 50,000 Anglicans. The UBE conference continues through July 27 and features President of the House of Deputies the Rev. Gay Clark Jennings and other guest preachers and celebrants, as well as a diverse range of workshops. Recent discovery of a significant group of African Americans among the First Communicants in Trinity Episcopal Church in San Jose, California (now Trinity Cathedral, San Jose). Founded in 1861. Rev. Peter Williams Cassey was ordained a deacon in 1866. His grandfather Rev. Peter Williams was an ordained priest in New York, founding St. Philip’s which thrives today. Seeking collaboration with UBE in writing his story for church publication and beyond. I’m working on the history of UBE and would love to speak with you. Feel free to contact me.